I was in the mood for sandwiches this week so I needed to make some bread. While my honey wheat sandwich bread was fantastic, I wanted something more savory. 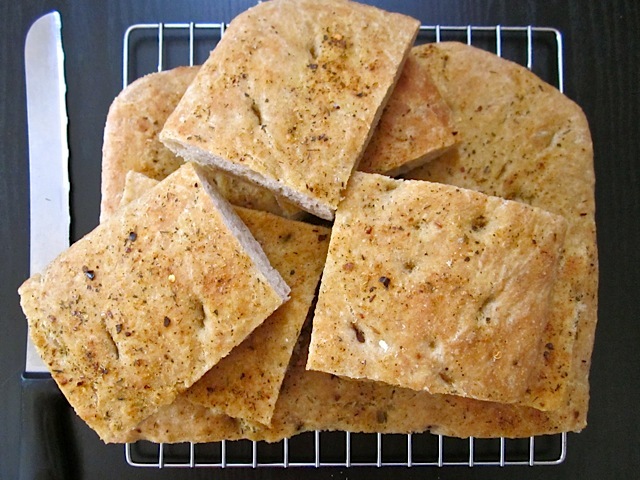 Then I got the idea, take the no-knead ciabatta and make it into focaccia! It turned out perfect and was so so so easy. 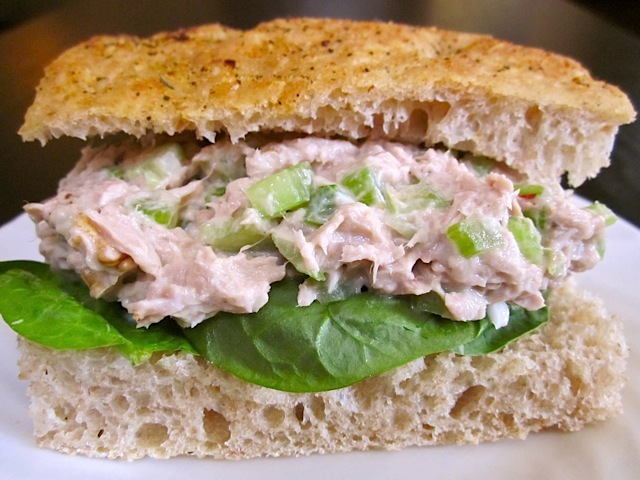 This recipe utilizes an over night fermentation which gives it incredible flavor. So, while the total time for this recipe is almost a whole day, there is probably less than 15 minutes of actual work that needs to be done. A delicious loaf of bread for just over a dollar and under 15 minutes of work? YES PLEASE! 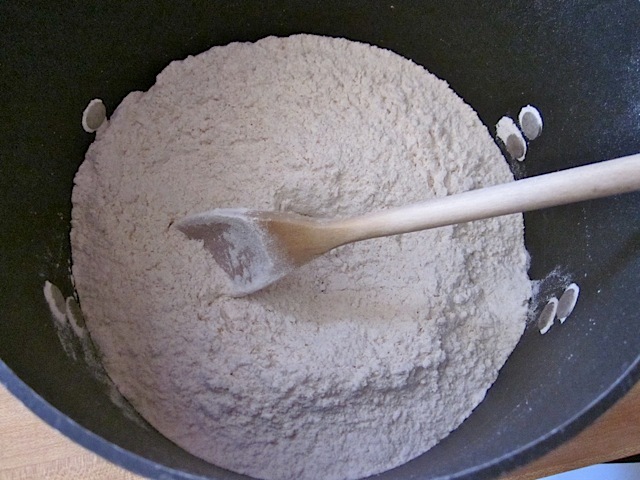 Stir together the flour, salt and yeast until evenly combined. Add the water and stir until everything is wet. 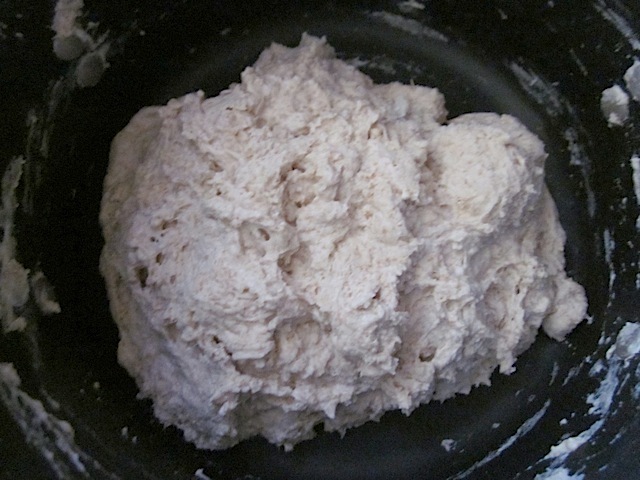 If the dough is not in one cohesive piece, add more water until there is no dry flour left. Only add a tablespoon or two at a time to avoid accidentally adding too much. 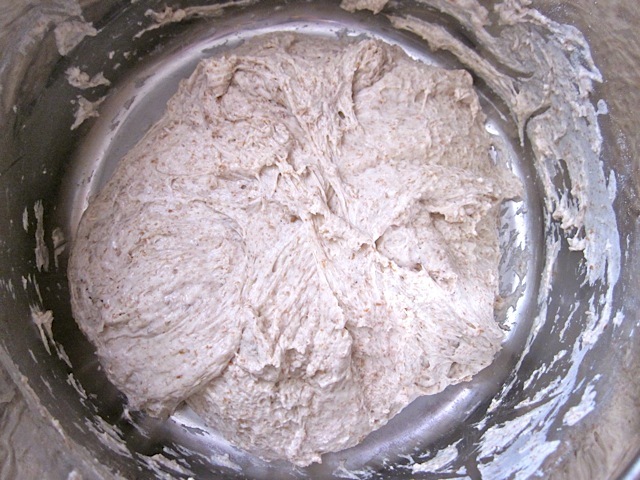 Allow the dough to sit, loosely covered over night at room temperature. After about 14 hours it will have expanded into a wet, fluffy, bubbly mass. Use a spatula to turn the dough in on itself a few times until it forms a ball of dough in the center of the pot. 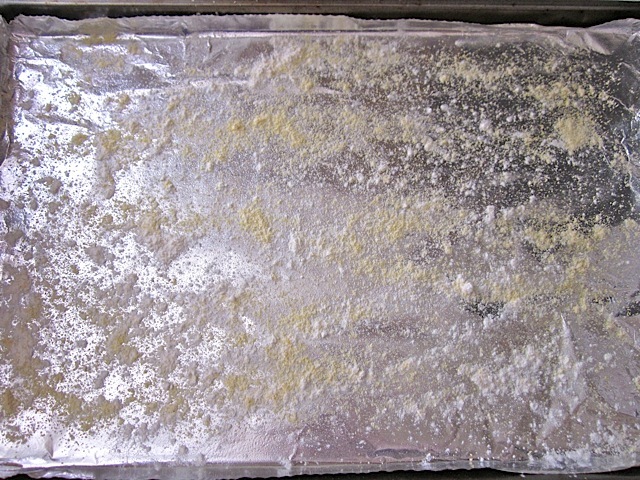 Prepare a baking sheet with foil, non-stick spray and a generous sprinkle of corn meal. Dust your hands with flour and sprinkle the dough with flour so that you can handle it without sticking to your hands. 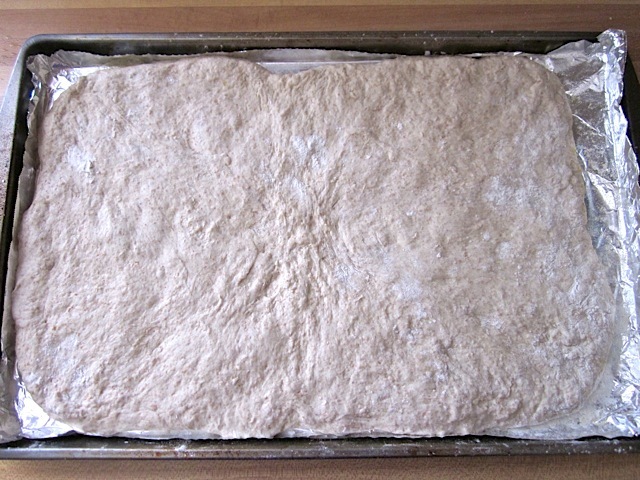 Transfer the dough to the baking sheet and stretch and press it out into the shape of a rectangle. It should be about 1/2 inch thick. It’s okay if it doesn’t come all the way to the edges of the baking sheet. 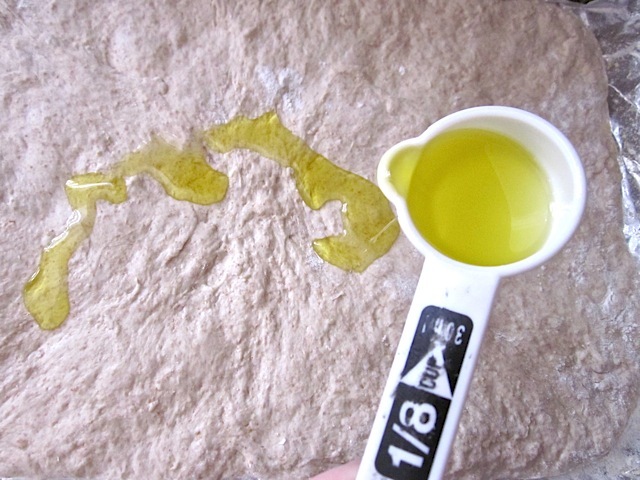 Drizzle olive oil over the top and then use a soft brush to spread it evenly over the surface. 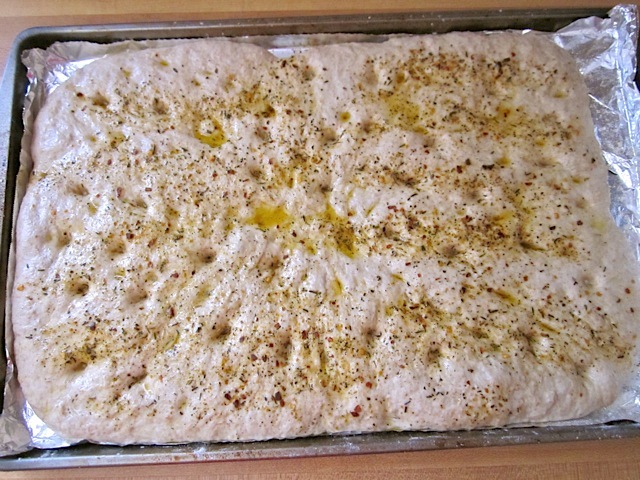 Sprinkle about 1 Tbsp of seasoning over the surface of the dough. 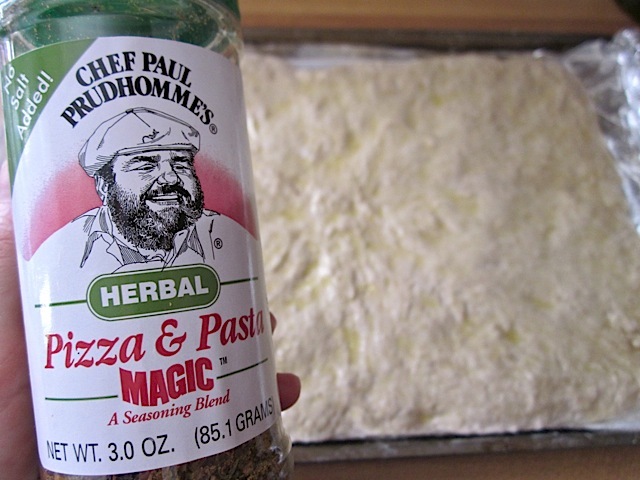 I used this pizza seasoning which is basically like Italian seasoning but you can use whatever you like. Let the dough rise for 1 hour then use your fingers to press dimples into the surface. The dough is now risen and ready to bake. Preheat an oven to 425 degrees. 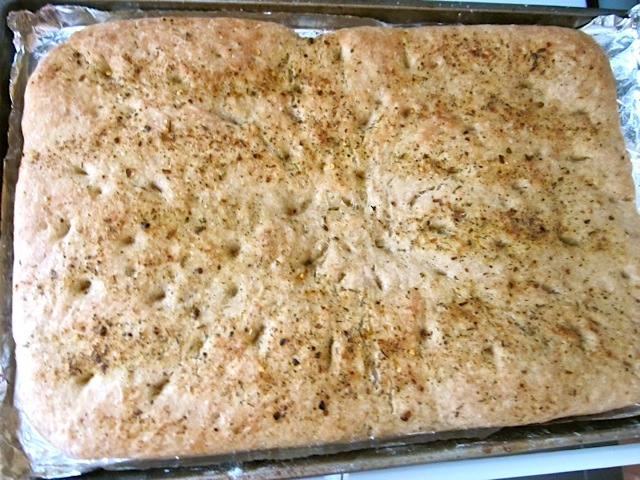 Bake the focaccia for 20-25 minutes or until the surface is golden brown. 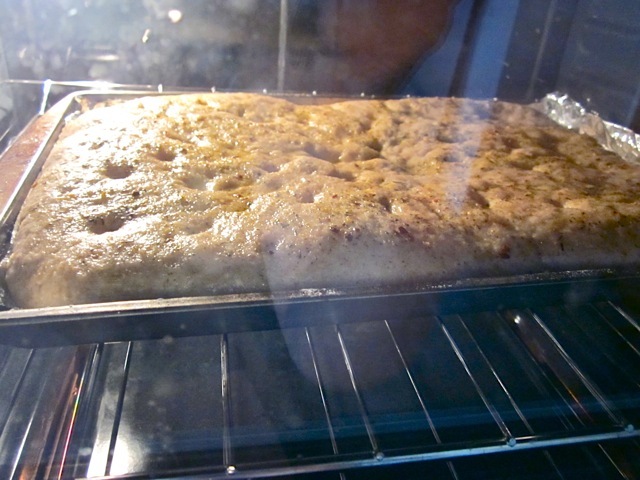 It will puff up a little bit more as it bakes. …and it smells DIVINE! After it comes out of the oven, transfer it to a wire rack to cool so that excess moisture can escape. Once cool, cut the focaccia into 12 rectangles for sandwiches or into strips if you plan to dip them in marinara like bread sticks! Split the rectangle in half and you’ll have the BEST bread for sandwiches EVER. So flavorful. Looks delicious! Could I make this with bread flour? And do I need more water then? Thanks! hey beth, I love this recipe and have made it before. But I just got a pizza stone for my oven and was wondering if you think it’ll be fine if I just cornmeal and oil the stone and cook it straight on there or if the dough will be too sticky and I’ll never be able to get it off?? I keep coming back to this recipe because it is so great! Easy and delicious! We eat a few pieces fresh that day and then I cut it into serving size pieces I freeze it. Reheat for 20 seconds and it is perfect for toasting or cut in half and use as a crust for a quick pizza. I also made ‘pizza’ with leftover spaghetti sauce and cheese which also worked well. It is my favorite bread to make. Oh dear, I believe you’ve created a monster! 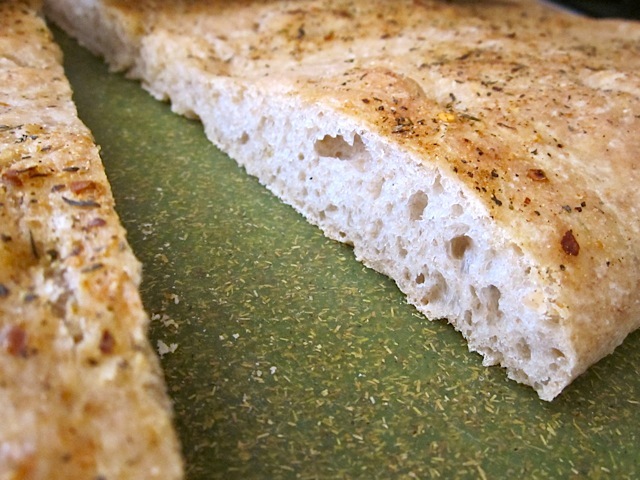 I’ve been a fan of the focaccia rolls for some time but this is even easier – good for my time budget, bad for my waistline! That’s ok. I’ll just have to work it off. My only regret is that I only just found your blog just shy of a year ago. So many wonderful and budget-friendly recipes! You’ve really given me a lot of confidence to try foods I wouldn’t have otherwise, so thanks for that! P.S. substituting uncooked polenta for the the cornmeal worked just fine. Most of it falls away before it hits the mouth anyway, but it leaves an amazing crust! I REALLY want to try this bread, but I don’t have any corn meal. Can I substitute corn grits (polenta) if maybe I whiz them up in the food processor first? Thanks in advance! That should work fine. The cornmeal doesn’t go into the dough, so you could even do without it if you want :) It just helps keep the dough from sticking to the baking sheet (although the oil is sufficient on its own) and it helps give a nice texture to the bottom. This was really easy and really yummy. I hoped to make sandwiches but mind turned out kind of flat. I think either 1) I stretched it out too much on the pan or 2) I put too much oil on it, not allowing it to rise enough. So, I improvised and made focaccia pizza. 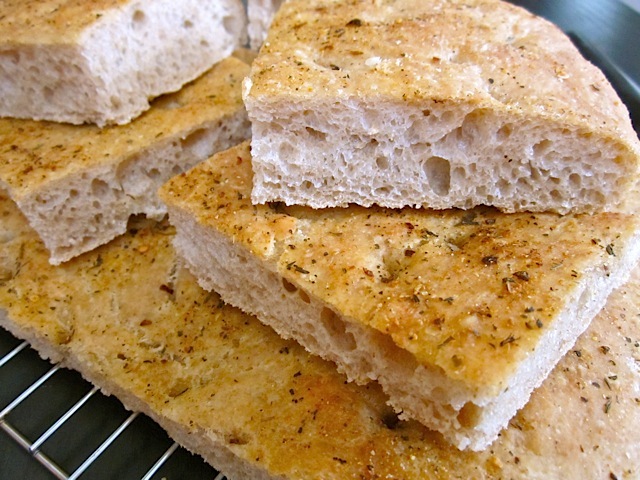 Traditionally focaccia is topped with olive oil, minced fresh garlic, minced fresh rosemary, and coarse salt (yum), but the bread is a really great blank canvas to top with whatever suits your fancy. Top with minced, olive oil packed sun dried tomatoes (but first, liberally brush the bread with the tomato oil, it’s delicious), add minced fresh basil, and grated Parmigiano Reggiano, and it’s equally yummy. 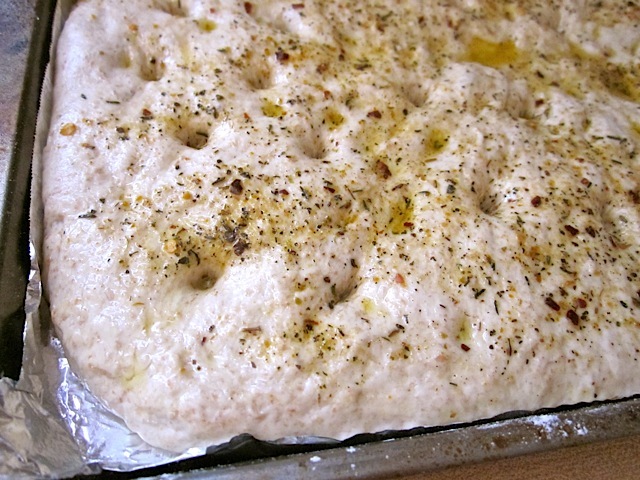 I need to bring bread for a holiday gathering next week and this focaccia is what I’ll be bringing, a couple of them with the toppings mentioned above. I double the recipe and put it in a big, plastic basin for the long rise (like the kind used for hand washing lingerie), and it works. 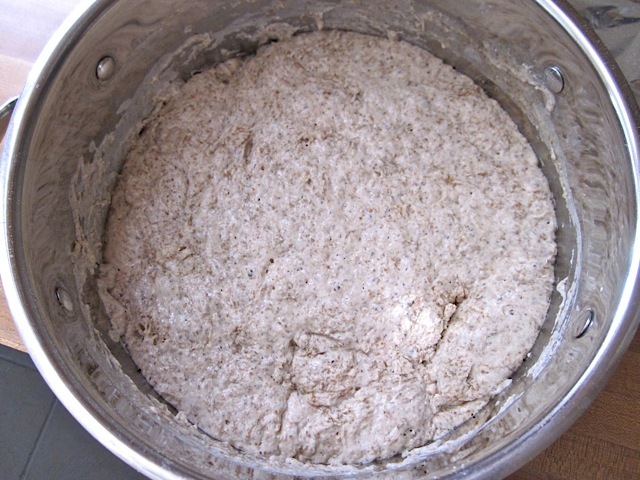 The dough is carefully divided in half before shaping, rising again, topping, and baking. I suppose if you want to try tripling the recipe, a big plastic bucket might work for the long rise. I am making this right now but replaced the Italian herbs with Indian! I sprinkled it with Cumin, torn fresh cilantro leafs and stalks, salt and a bit of green onion that I had hanging around. The smell is divine! Do you know if this type of fermentation breaks down phytic acid like traditional soaking methods? deneenie – Hmm, I’m not sure. I have absolutely no experience working with gluten free flour, but I do know that gluten is vital to the texture of bread… so, I’m pretty sure it would change it quite a bit. Miriam – I’m not quite sure what size pan I used that day (I have three sizes), but I think it was just a basic sized baking sheet. It would be okay to use a slightly smaller or larger pan. 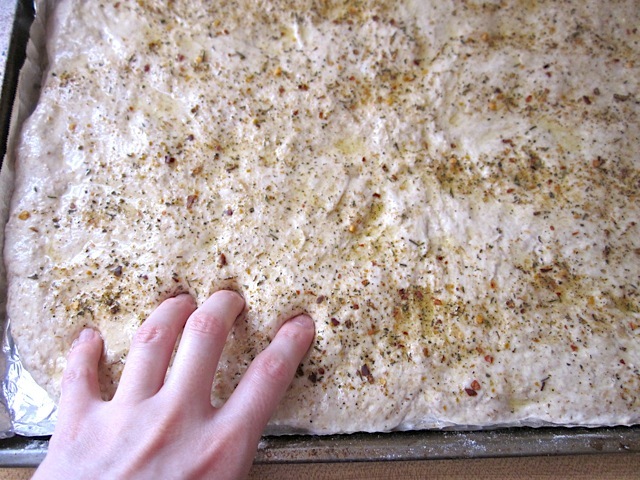 If you have a smaller pan, your focaccia will be slightly thicker and if you have a larger pan you can just not stretch it all the way to the edges. I think my dough was about an inch thick when I first stretched it out, so hopefully that will help guide you. Hi! Can you tell me what size pan you used? Can I use all AP flour? Does bread flour make it any different? I accidentally put an entire packet of yeast in..oopsy. Still turned out fantastic! I also chopped up some garlic and pressed it into the dough right before I put it into the oven. YUM!